Kilbroney Timber Frame are experts in this increasingly popular method of sustainable and efficient construction, with over thirty years of experience in the Irish house building market. For several of their high-spec projects they have chosen to work with DuPont membranes, both for peace of mind and in order to achieve the desired superior results. Their latest project is an upmarket detached private home in Rostrevor, Ireland built to special commission. 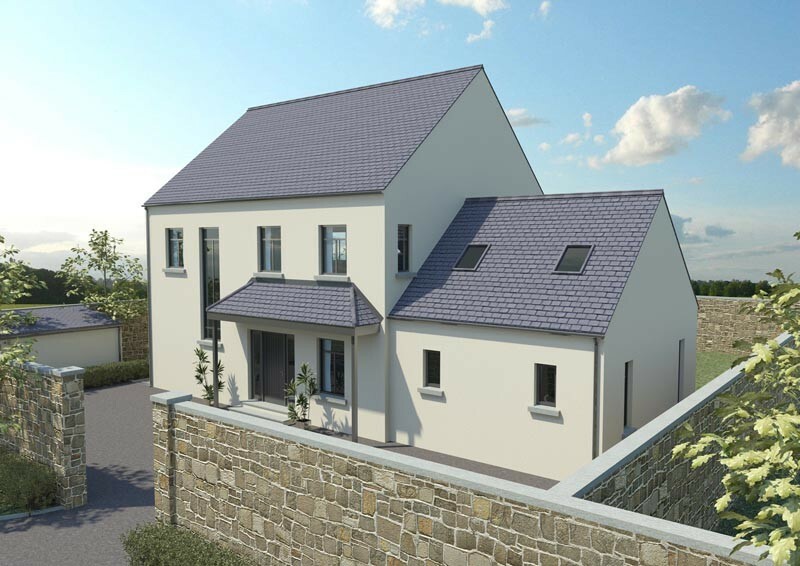 A two storey construction with warm-pitched roof and attic rooms, the house offers three bedrooms and a large open plan kitchen living area with a vaulted ceiling. 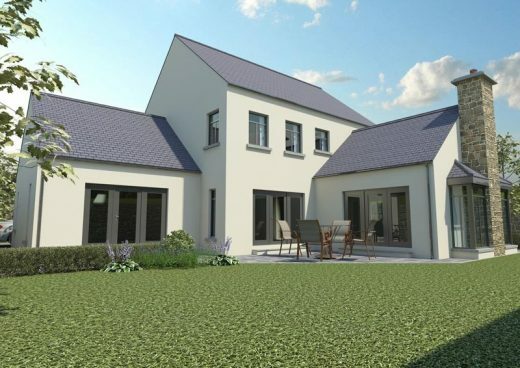 This high-spec timber frame new build by www.kilbroneytimberframe.com in Rostrevor, Ireland uses an advanced membrane and AVCL system by DuPont to achieve impressive U-values and airtightness results. Built to standards beyond regulation and for optimum energy performance, the project features the very best in building envelope technology. Over an ecologically sourced timber frame, DuPont™ Tyvek® Reflex has been installed to the external walls with DuPont™ AirGuard® Reflective AVCL to the interior walls. In between is fitted 140mm insulation board and a service batten. Finally, the walls are finished internally with plasterboard and externally they are rendered. The roof covering is slate and the windows are Alu clad and double glazed. The house performs as impressively as it looks, with pressure tests for airtightness from the use of the DuPont membrane system coming in as 0.94m3/(h.m2)@50Pa, with U values of 0.12 wm²k for the timber frame external walls, 0.12 wm²k for the ceilings and 0.12 wm²k for the vaulted ceiling. 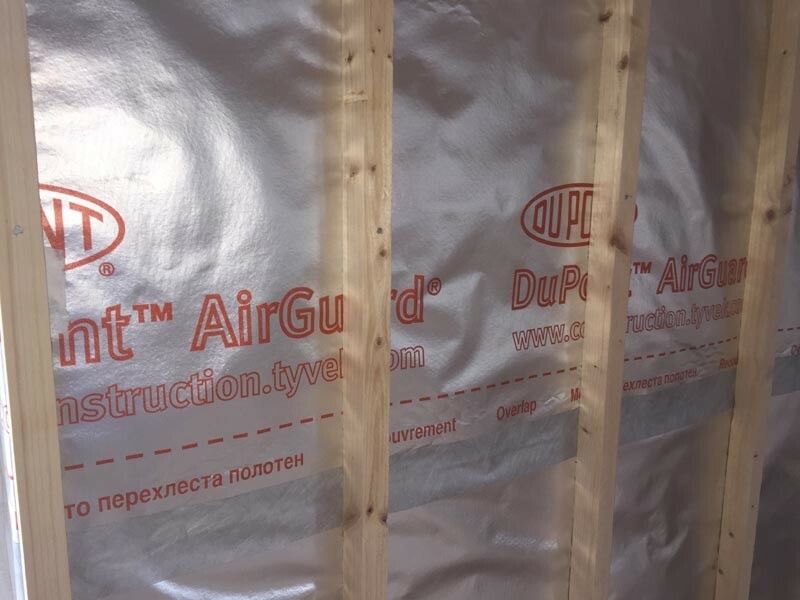 DuPont™ AirGuard® Reflective is a metallised air and vapour control layer which is 100% airtight and protects against vapour transmission from the interior into the building envelope. Combining high reflectivity and very low emissivity DuPont™ AirGuard® also enhances thermal performance. DuPont™ AirGuard® works together with other membranes in the DuPont™ Tyvek® family and special tapes and sealants to create an air-tight building envelope. This minimises internal thermal losses and helps to create a more comfortable interior environments, while offering significant energy savings. Although sophisticated in terms of technology, DuPont™ AirGuard® is lightweight and simple to install and suitable for either new build or renovation projects. DuPont™ Tyvek® Reflex is a vapour permeable, windtight and watertight membrane ideal for timber frame and vertical cladding, where its properties allow water vapour to diffuse from the structure while also protecting it from the elements. The lacquered, low-emissivity surface ensures long term performance by preventing the metallised surface from oxidising. This means that the functionality of the material is assured from the initial construction process through many years over the life of the building. DuPont™ Tyvek® membranes offer proven durability against both heat and UV stress and ageing. This combination of reliability, service and technical assistance helps to ensure that a building operates as the design intends. 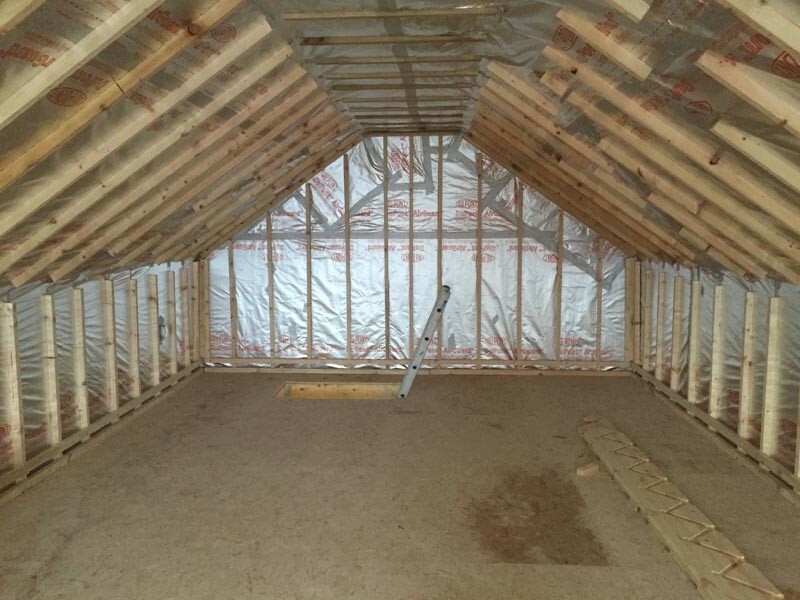 This high-spec timber frame new build by www.kilbroneytimberframe.com in Rostrevor, Ireland optimises both DuPont™ Tyvek® Reflex metallised breather membrane and DuPont™ AirGuard® Reflective AVCL to achieve impressive U-values and airtightness results. For more information about DuPont™ Tyvek® and DuPont™ AirGuard® in the UK please visit: www.construction.tyvek.co.uk or call 01275 337 660 (087 922 2740 in ROI).